Firm President and Senior Partner William Jungbauer has been named to Thompson Reuters’s Super Lawyers List for 2018. This marks the 13th consecutive year that Jungbauer has been so recognized. No more than 5% of the attorneys in the State of Minnesota may be recognized as a SuperLawyer. Joining Bill Jungbauer on the list for 2018 is Christopher Bowman who has been named a 2018 Rising Star. Rising Stars must be either under the age of 40 or have been practicing for fewer 10 years, and the number is capped at 2.5% of the total number of attorneys in the State of Minnesota. Super Lawyers, part of Thomson Reuters, is a rating service of outstanding lawyers from more than 70 practice areas who have attained a high degree of peer recognition and professional achievement. The annual selections are made using a patented multiphase process, which results in a credible, comprehensive, and diverse listing of exceptional attorneys. The Super Lawyers and Rising Stars lists are published nationwide in Super Lawyers Magazines and in leading city and regional magazines and newspapers across the country. Super Lawyers Magazines also feature editorial profiles of attorneys who embody excellence in their practice of law. For more information about Super Lawyers, go to SuperLawyers.com. Effective on February 1, 2017, BNSF imposed a revised version of its Policy for Employee Performance Accountability, or PEPA. BNSF has historically used previous versions of PEPA to harass and intimidate its employees. On its face, PEPA proclaims honorable goals of uniform interpretation and enforcement of BNSF rules. 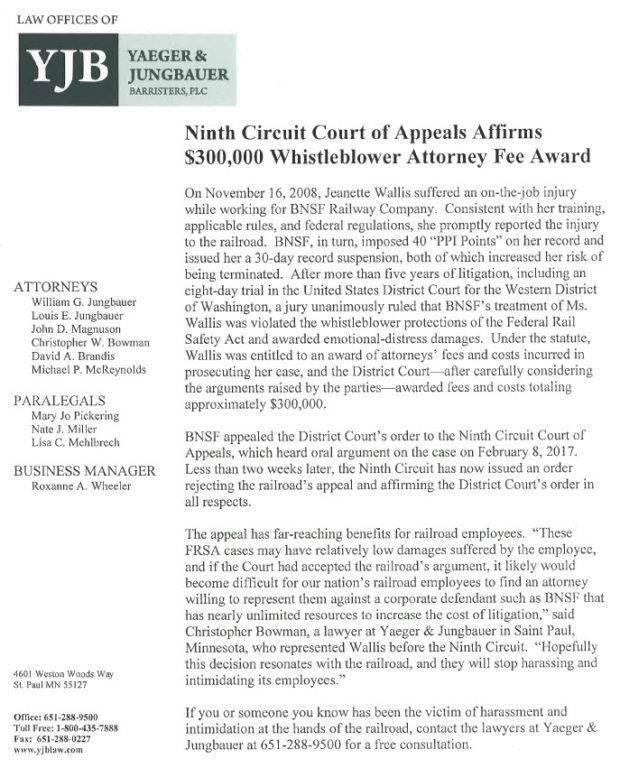 Pulling back the curtain, however, it becomes clear that PEPA is a vehicle by which BNSF Management can unfairly target and discipline employees on an unequal basis at the discretion of BNSF Management. A prime example of such mistreatment is the “Level S” discipline, allowing the railroad to target an employee who “causes trouble” by reporting unsafe policies, unsafe work conditions or equipment, or reports injuries. The employee is given a chance to “accept responsibility” for some vague rule infraction or face the prospect of a full, on-site investigation, conducted without the benefit of legal counsel, where BNSF serves as Judge, Jury, and often executioner. Once the employee has one “Level S” on his or her record, the employee is subject to termination for a second “Level S” at the discretion of BNSF management. While the length of time that an employee is on probation may vary, the consequences of a “Level S” are very real. 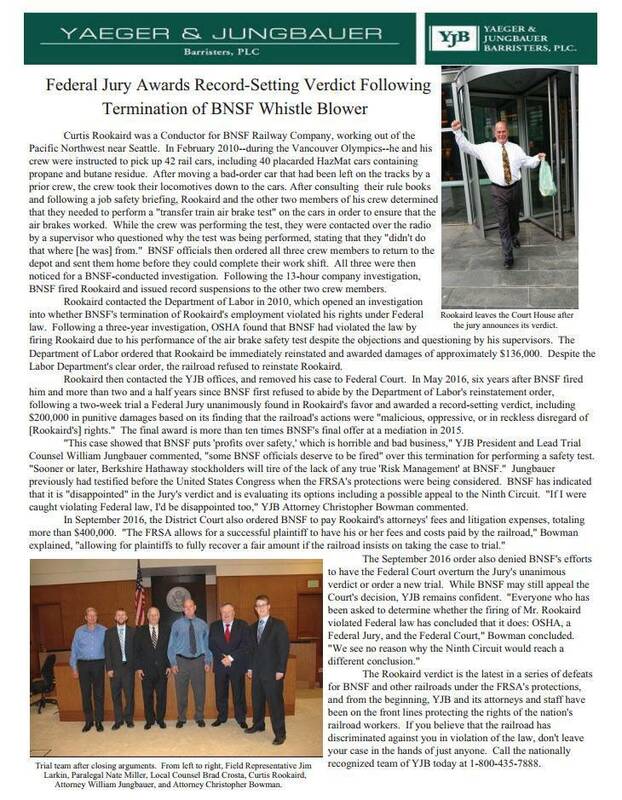 BNSF has had various “alternative handling” policies over the years, most of which require that the employee admit fault to whatever infraction they stand accused of in writing. Along with this new version of PEPA, BNSF is introducing its latest version of the Admit Fault Program, now styled the “Risk Reduction Education Program.” Once again, the employee is required to admit fault in order to qualify—at BNSF Management discretion—for the program. 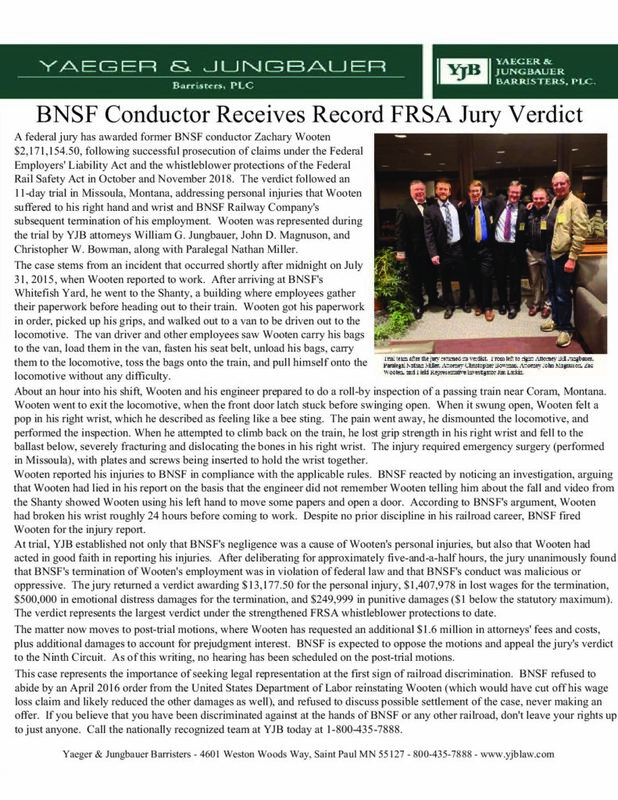 BNSF wants the employee to admit what he or she could have done to prevent the injury, but does not want to hear or document what BNSF did wrong or what it could have done to make the workplace safer. If the employee participating in this program has a personal injury, their forced admissions have the possibility of destroying the employee’s rights and claims under the FELA. Annotated copies of this new policy and implementing documents are available at the links below. If you have any questions, do not hesitate to contact one of the YJB attorneys to help. UPDATE (NOVEMBER 8, 2018): The Ninth Circuit Court of Appeals issued its decision in the case, in which it found that the district court had erred by granting the employee summary judgment on the question of whether the performance of the safety test was a “contributing factor” in the railroad’s decision to terminate the employee, remanding the case for a new trial. Importantly, however, the appellate court did not say that the railroad was entitled to a new trial on all issues, leaving that determination to the district court. The Ninth Circuit also rejected BNSF’s argument that the whistleblower protections found in the FRSA applied only when the employee refused to participate in an actual violation of a rule or regulation, finding that the FRSA protects railroad employees who engage in a “good-faith refusal to undertake conduct the employee believed to be violative of a law, rule, or regulation, even if the conduct at issue would not constitute an actual violation of a law, rule, or regulation if performed or continued.” The opinion therefore should be viewed as a win for railroad employees–notwithstanding the limited remand–as it clarifies that the FRSA is a protective statute, and employees need not have the benefit of a Federal Judge and several days of testimony in order to invoke the statute’s whistleblower protections. The Fifth Circuit Court of Appeals has reversed a district court’s dismissal of an FRSA whistleblower claim, holding that the procedures utilized by the Public Law Board in reviewing a claim under the Railway Labor Act are insufficient to allow for the collateral-estoppel doctrine to give preclusive effect to a fact found by the PLB in a subsequent federal court action. The employee was injured when he was walking on a catwalk toward the back of an engine he had just inspected when, the next thing he knew, he was laying on the ground. He told the railroad that he didn’t know what had happened, that he “must’ve mis-stepped and fell off the engine, [and] next thing he knew he was on the ground.” After more details emerged about how the incident happened, BNSF claimed that the employee had been less-than-honest and concealed the cause of his fall, and noticed an investigatory hearing. The railroad held the employee out of service over his objections and despite such action being against his contract. The hearing was eventually held and the railroad claimed that the employee had failed to furnish complete information about the circumstances leading up to his injury and had been dishonest by not furnishing complete information about the incident. The conducting officer, who had been one of the people involved in deciding whether or not to charge the employee with rules violations, recommended termination, and the railroad fired the employee, despite the fact that he had a previously clean discipline record. The employee appealed to the PLB, which found that while termination was too severe of a sanction, the employee had been dishonest about his injury. YJB filed a claim on the employee’s behalf, arguing that the railroad’s treatment of the employee was due, at least in part, to his suffering an injury while on duty, in direct violation of the Federal Rail Safety Act. The railroad argued that the PLB’s finding that the employee had been dishonest about his injury precluded any claim, as the employee had not reported his injury in good faith. Without the benefit of oral argument, a magistrate judge agreed with the railroad and dismissed the claim by way of summary judgment. YJB appealed the decision and attorney Christopher W. Bowman represented the employee before the Fifth Circuit. Less than two weeks after oral argument, the Fifth Circuit vacated the summary judgment order, concluding that the procedures used by the Public Law Board-namely a review limited to a record of an investigation conducted by the railroad-were insufficient to allow for the collateral-estoppel doctrine. The Court also incorporated the 7th Circuit recent holding in Reed v. Norfolk S. R.R., finding that the FRSA’s election-of-remedies provision does not bar an employee from filing an FRSA claim after pursuing a grievance under the collective bargaining agreement. There are thousands of miles of track, most of it unguarded. And traveling on them are 10,000-ton trains hauling hundreds of thousands of gallons of hazardous chemicals. In the wrong hands, there is so much potential for harm. Then why did the Problem Solvers find so many Burlington Northern Santa Fe Railway trains for the taking? “Anyone can walk inside those cabs,” said “John,” another long-time BNSF engineer. The Problem Solvers agreed to conceal the identities of both men since they are risking their jobs by coming forward. Both men are deeply concerned about BNSF’s long-time practice of leaving running trains unattended. During several months of investigation, the Problem Solvers made some startling discoveries that raise serious questions about railway security. At 2 a.m. in the heart of a small Eastern Washington town, a Burlington Northern train rolled to a stop and was left by its crew. There were no security crews present. The Problem Solvers climbed on board. The locomotive was unlocked, the engine was still running and the key, called a reverser,was left inside. The attached tank cars held sulfuric acid, a powerful corrosive that can burn and release toxic vapors. Yet on this night, the running train sat for six hours, a vulnerable target idling alone just 30 miles from a city of nearly a half-million people. “I hate to say it, but left unattended, running like this, these are a potential weapon of mass destruction,” said Bill Jungbauer, a Minnesota attorney who became concerned about the gaps in security through several lawsuits he filed on behalf of injured BNSF workers. Burlington Northern engineers say the railway leaves a number of running trains unattended all day and every day across Washington state and the country. BNSF says the trains are left running to keep air in the compression brake system. But the engineers KOMO News spoke to say the BNSF’s long-time practice of leaving locomotives unlocked, running and unguarded is tempting fate. The Problem Solvers have chosen to be very selective about the information released in this story; KOMO News does not intend to instruct anyone on how to operate these trains. But BNSF engineers say it’s not difficult to get the locomotive moving, particularly since it’s the railroad’s practice to leave the key – or the reverser – inside the cab so the next crew can find it. Of serious concern are the unguarded, running trains the Problem Solvers found within miles of the state’s major oil refineries. One of these trains was left running, unlocked and unattended in broad daylight. In both cases, the locomotives were attached to tank cars loaded with flammable liquid petroleum gas. “It could sit out there for hours. Eight, 10 hours,” said engineer John. “If they were to collide with any other train, or topple or break open, they could kill and maim thousands of people,” said Joe. In all of these cases, the Problem Solvers were able to board the trains and get undercover video without ever seeing any security or railroad police officers. Yet when KOMO News showed the undercover video to Burlington Northern officials, BNSF spokesman Gus Melonas said, “How do I know that’s an actual reverser?” Melonas refused to believe it had been so easy to board their trains. Melonas never acknowledged that the Problem Solvers’ ability to board running trains might be a security threat. Instead, Melonas assured KOMO News BNSF has ways to stop an intruder from moving these unattended trains. “We have monitors. We have detectors. We have sensors. We have eyes on the railroad at all times,” he said. But the Problem Solvers never saw any eyes on these running trains that had been left unlocked. And the engineers who pilot them every day insist they could never be stopped fast enough to prevent disaster. “Manned, these trains could go as far as their destination, or as far until they met another train,” said John. The Federal Railroad Administration, the agency responsible for oversight, has now opened a formal investigation into what the Problem Solvers found. “Safety along America’s railways is FRA’s top priority,” wrote agency spokeswoman Brie Sachse. Jungbauer has confronted Burlington Northern about the lapses in security before, and the Problem Solvers obtained a videotaped deposition from an unrelated lawsuit filed by Jungbauer. In it, Burlington Northern’s senior trainmaster Doug Kayser admits the company has never conducted a security test to see if an intruder could get one of these trains moving, even with the brakes applied. Even the BNSF spokesman admits a terrorist or intruder could get one of these unattended, running trains moving. “Nothing is impossible. But it’s extremely, highly unlikely,” said Melonas. 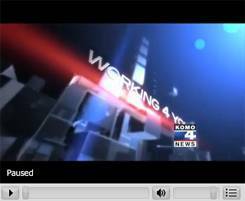 But the engineers KOMO News spoke to worry tragedy will have to strike before BNSF changes its procedures. U.S. SUPREME COURT: FELA REMAINS UNCHANGED! Since Congress enacted FELA in 1908, courts have interpreted the statute’s language as requiring a lower standard of proving causation. This interpretation has become a keystone of FELA cases and makes it easier for injured railroad workers to recover damages than litigants do in traditional cases. 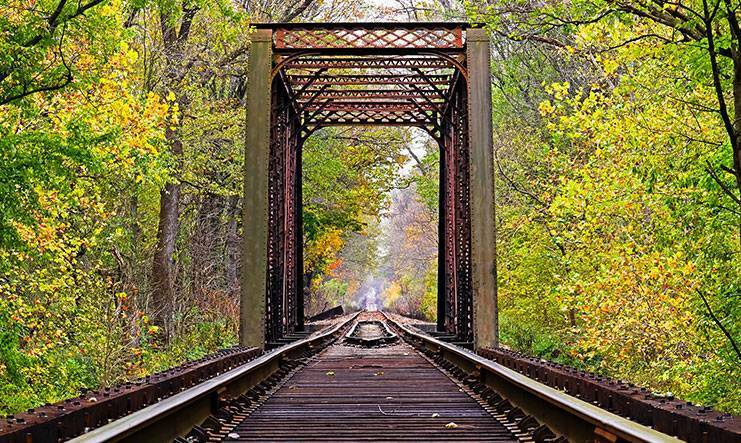 Because it eases the path of recovery, the railroad industry has been trying to change this standard for more than fifty years. In one of the most important FELA decisions in the last century, the United States Supreme Court held that the liberal causation standard used in FELA actions would not be changed to a stricter causation standard advocated by CSX and all major railroads. It is a huge win for all railroad workers. CSX and the Association of American Railroads argued that the Supreme Court should change the causation standard used in FELA cases from “causation in whole or in part” to the more restrictive “proximate causation” standard used in many other legal actions. If CSX and the railroad industry had been successful, all injured railroad workers and their families, as well as widows and families of railroad workers killed on the job, would have had a more difficult task in obtaining just compensation in FELA cases. 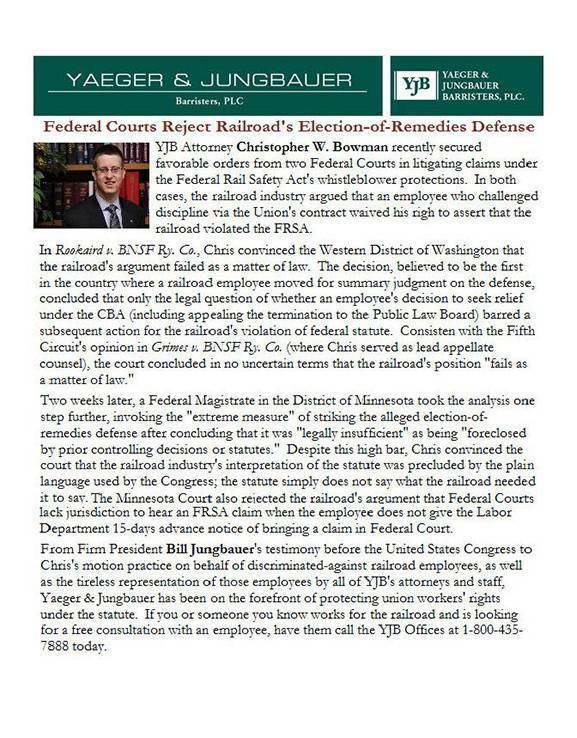 In an effort to counter the power and influence of the AAR and its Railroad Members, the Academy of Rail Labor Attorneys (ARLA) decided it would file its own amicus curiae brief with the Supreme Court in this important FELA case. One of the major focuses of ARLA’s brief was highlighting the reliance courts and injured workers have placed on the Supreme Court’s past decisions interpreting FELA as having a relaxed causation standard. This included outlining the major impact deviating from the current standard would have on railroad workers across the country. Justice Ginsburg’s opinion closely follows the template laid out in ARLA’s brief advocating that the court follow its past decisions and showing that courts across the country closely adhere to the standard. Justice Ginsburg specifically references the ARLA brief in her opinion. Further cementing the importance of the brief is the fact that none of the other amicus briefs are referenced by name anywhere in the opinion. This is not the first time that Bill Jungbauer has been called upon to represent the interests of Railroad workers in the Supreme Court. Jungbauer represented the Brotherhood of Locomotive Engineers in filing its Amicus Curiae Brief to the U.S. Supreme Court in the important FELA case of Norfolk Southern v. Ayers, which turned out to be another huge victory for all railroad workers and a devastating defeat for Rail Carriers. Jungbauer, Sayler and the firm of Yaeger & Jungbauer Barristers, PLC donated all of their time, efforts, and expense to researching the brief, discussing the issues of the case with numerous lawyers in the firm and around the country, writing and rewriting the brief, and finally submitting the brief to the Supreme Court. Below is a link to the Amicus Brief of the Academy of Railroad Trial Attorneys (ARLA) which has been submitted to the U.S. Supreme Court in the case of CSX v. McBride. This is the most important FELA case before the Supreme Court in the last 50 years and one of the most important FELA cases of all time. 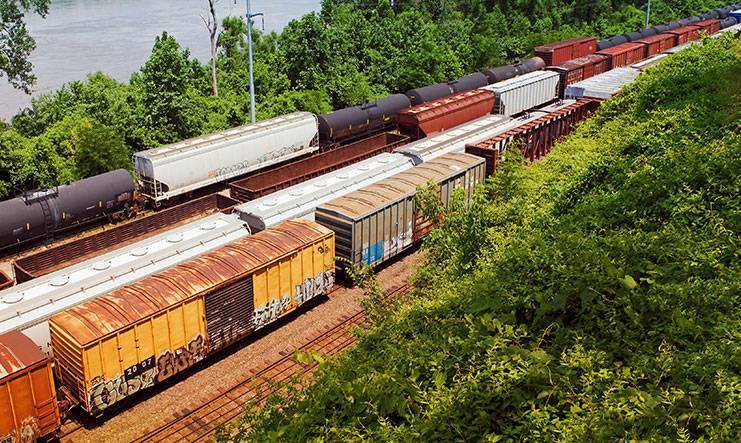 CSX and all Carriers through the AAR are trying to change the law to a much tougher legal standard of recovery for Injured Railroad Workers and their families under the FELA. The term is called “proximate cause,” which can be interpreted as a much tougher standard than FELA language of causation “in whole or in part.” AAR and CSX argue that “proximate cause” in the FELA would be a much tougher standard of recovery. We argue that the FELA has a much more relaxed standard of recovery whether the Court calls it “proximate cause,” legal cause, FELA cause, etc. The oral arguments before the Supreme Court will take place on March 28, 2011 at 11:00 a.m. Eastern Time. 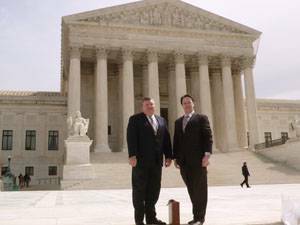 Our office will attend the hearing and report back to you on our impressions of the Supreme Court hearing. A final decision of the Supreme Court is not expected for a number of months. Of course, we will immediately advise you of the Court’s ruling in this important matter. This is the first time that ARLA has submitted a brief to the U.S. Supreme Court on any matter. ARLA is comprised of FELA lawyers from around the country who represent injured workers under the FELA. ARLA works closely with all Rail Unions to educate and inform union leaders and union members of their rights under the FELA. 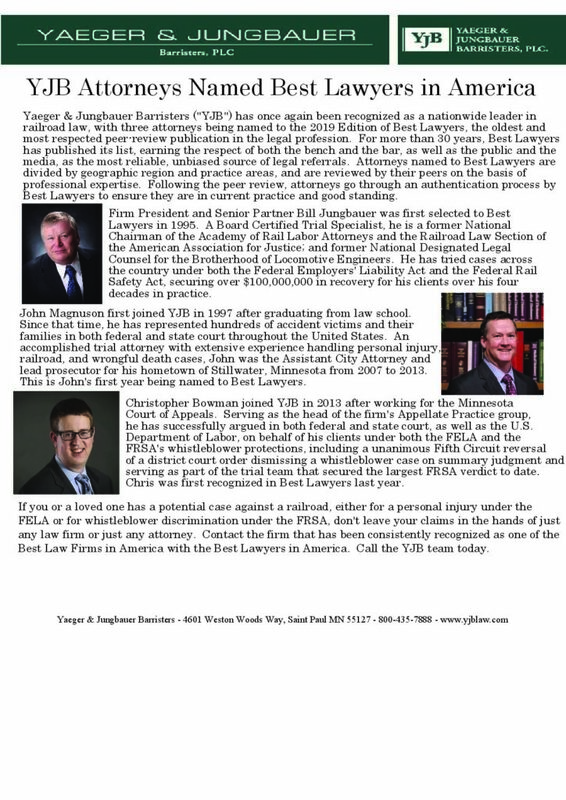 Yaeger & Jungbauer Barristers, PLC is proud of the fact that ARLA through its Board of Directors voted UNANIMOUSLY TO SELECT BILL JUNGBAUER OF YJB TO REPRESENT ARLA AS COUNSEL OF RECORD IN WRITING THE ATTACHED BRIEF. Jungbauer previously represented the Brotherhood of Locomotive Engineers as Counsel of Record in BLE’s Amicus Brief in the U.S. Supreme Court case of Norfolk Southern v. Ayers. That case turned out to be a big victory for injured railroad workers and their families. Workers Rights are under attack in Legislatures in states such as Wisconsin, Ohio & Indiana; Workers Rights are also under attack in state and federal courts. United we will prevail. We all must make sacrifices in these battles. I am proud to report that all of our legal services in these Supreme Court battles have been donated free of charge on behalf of injured workers and their families. 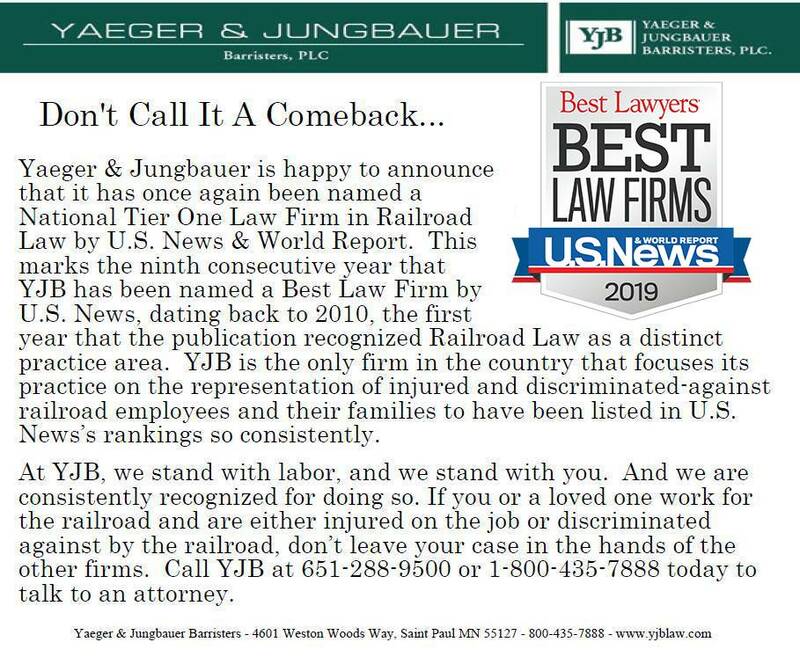 Experienced and aggressive, the railroad accident law firm of Yaeger & Jungbauer Barristers, PLC gets results, in court and at the negotiating table. A specialized FELA attorney knows how to take on railroads, corporations and their well-funded insurance companies, and we have recovered millions on behalf of our clients. 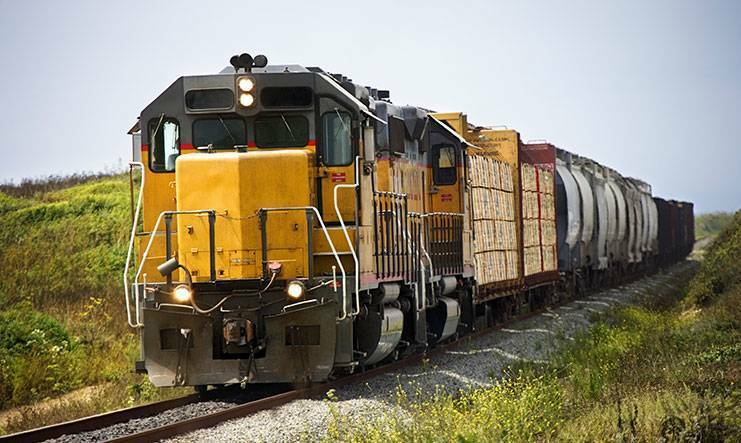 The firm provides cutting-edge representation to injured railroaders throughout the United States in actions brought under the Federal Employers’ Liability Act (FELA), as well as the Federal Safety Appliance Act (FSAA) and the Federal Locomotive Inspection Act (LIA). Most recently, the firm has enjoyed great success in pursuing carpal tunnel claims against the railroads. Our personal injury team provides exceptional representation to injured people in automobile, products liability, general negligence and aviation cases. Our many years of experience and nationwide presence means injured people and their families have access to the highest quality legal services at a moment’s notice. When you are seriously injured it can feel like your whole life is out of your control. You may feel scared and vulnerable, you don’t know what is going on or who to believe. You need solid advice you can trust when it comes to pursuing a claim under the Federal Employers’ Liability Act. Yaeger & Jungbauer Barristers, PLC is dedicated to representing railroaders and working people throughout the United States who have been injured due to the negligence of others. If you or a family member has been injured in an auto, aviation or railroad accident, call a FELA attorney right away. We will help you understand your rights and explain what you need to do to make sure you get the medical treatment and financial recovery you need to put your life back together. In the event of an emergency after regular business hours, call our toll-free number and we will have one of our staff contact you immediately. Have you recently worked with this lawyer? Share your experience as a Client of this lawyer and complete a Client Review to help others make an informed choice when hiring legal counsel. OUR LAWYERS WROTE THE BOOK!! Why use a law firm where the attorneys have to consult reference books to understand the basic concepts of FELA? Bill Jungbauer, in collaboration with other attorneys in the firm and with James R. Loumiet, B.S.M.E., has authored “Train Accident Reconstruction and FELA and Railroad Litigation.” The book is published by Lawyers and Judges Publishing Company, Inc. Now in its 4th edition, the book is a reference manual used around the country. 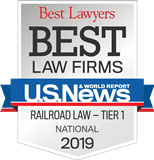 Our attorneys have decades of experience in railroad law and work collaboratively with each other to share information, research, and new concepts. Using one of our attorneys provides you with a depth of experience unmatched around the country. Even though this depth of experience is an important reason to select Yaeger & Jungbauer Barristers, PLC, our attorneys communicate with other attorneys around the country to assist them. In the writing of this book, Bill has followed the belief that: unlike some attorneys who do not believe in sharing the fruits of their labors in print for fear that other attorneys may learn their secrets, at YJB we believe that a full exchange of ideas and research will be of some assistance to all attorneys who practice in this field and make for better law. The testimonials and case results contained herein do not constitute a guarantee, warranty or a prediction of the results in your case. See more of our verdicts, awards and settlements. Am insurance bad faith verdict. A man and his wife were sitting in their parked pickup truck when they were struck and injured by a taxicab.